Victoria “VikkiKitty” Perez had been competing at Super Smash Bros. 4 for five months when local tournament organizers plucked her out of the contender’s pool and threw her on stage to commentate. Over the PA one 2015 tournament in Fort Lauderdale, Florida, everybody heard the words, “Victoria, come into the stream room.” It wasn’t a question, not that Perez would have give herself the option to say no. Perez, 22, is on top of this world now, commentating national tournaments, including Overwatch and Arms, viewed by hundreds of thousands of people. Most notably, Smash publisher Nintendo invited Perez to commentate the 2018 Smash Ultimate invitational at E3, the first tournament of the much-hyped upcoming game. For hours, Perez was perched on stage breaking down the brand new game and seamlessly transitioning between descriptions of its most basic elements (“When a fighter is knocked off the stage, it is a K.O.”) and deep analyses of spatial control and “tech.” 200,000 viewers tuned in at its peak. Perez is also just about to graduate college in Miami, Florida. 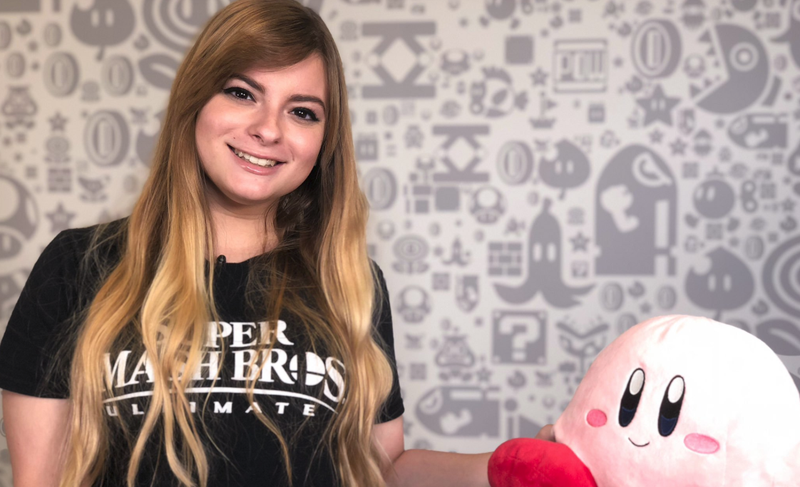 Between studying for her communications degree and living the student life, Perez’s part-time job has her traveling the world to sportscast Super Smash Bros. on livestreams. When her face appears on camera, it’s usually framed by long, blonde hair, dyed neon colors at the ends, and an enormous pair of headphones. Commentating wasn’t something Perez had planned on doing. As an elder sister, Perez had a casual Smash sparring mate throughout her childhood, but also enjoyed longer role-playing games like Kingdom Hearts. She hadn’t considered competitive gaming until a couple of years ago when she unearthed her copy of 2008’s Super Smash Bros. Brawl from her living room along with some high school friends. She became obsessed. Once Smash 4 came out, Perez and her friends began to take the game more seriously. “We thought we were the best,” Perez laughed, explaining her impetus to start attending tournaments with her well-honed Kirby. Soon, she learned, “We were literally nothing.” Perez kept grinding, though, until she saw the results she wanted. At one tournament, “I sat down at a setup and I beat eight people consecutively,” Perez said. “I was like, ‘You know what? I’m all for it.’” She’d drive an hour away from her home to play competitively, cutting her teeth against others’ skillsets until she’d honed her own. At the same time, Perez found herself seduced by the game’s deep mechanics and talking about them with mentors and competitors. On the drive home, she and her friends would tease apart which small mistake landed them in the loser’s bracket or which small success thwarted their opponent. That ability to dissect the game’s particulars caught the attention of others in her local scene and ended up getting her pulled on stage in October 2015 to commentate her first local tournament at South Florida’s Versus Gaming Center. It’s also why, in her words, she was “fed to the sharks” three weeks later when she was asked to commentate at a regional tournament called Frame Perfect. “I went from being completely chill—literally just looking at the game and talking about it—to getting more nervous as time progressed,” Perez said. The nerves showed up as Perez realized how much more she had to learn. Perez had not yet memorized the game’s match-ups—hundreds of combinations of how one fighter’s toolkit matches up to another’s—or the game’s more specialized mechanics. She was disappointed by her performance, but she welcomed the feedback from her fellow commentators, who gave her tips like to let her co-commentator finish talking before she injected her own analyses. More and more invitations brought Perez more and more work, including from Nintendo, as she continued pursuing her degree full-time in Florida. Over a few short years, Perez became the first notable female Smash commentator. As she rose to prominence, she got a lot more feedback, but not all of it was helpful. 2016 brought more scrutiny on Perez, but not the kind she had been working towards. That year, Perez went to EVO to witness its enormous Smash tournament. During the event, her then-boyfriend invited high-profile Smash player Cristian “Hyuga” Medina to crash in their hotel room because he was intoxicated. Perez says she fell asleep next to her boyfriend and woke up to Medina groping her. At the time, Perez explained the situation on Twitter and wrote that she was coming forward “only to prevent future incidents like this from happening ever again” and to warn other tournament attendees to be careful. Medina, who said he didn’t remember anything from that night, was consequently dropped from his sponsorship.